The City of Calgary is situated in the Western Canadian Province of Alberta, in the foothills of the Rocky Mountains with its centre located at the junction of the Bow and Elbow Rivers. In 1875 the settlement that was to become Calgary was established by the Northwest Mounted Police. Its purpose was to protect the fur trade and the western plains from whiskey traders coming from the south. Originally named Fort Brisebois after a NWMP Officer Ephrem Brisebois, Calgary got its name a year later in 1876 from Colonel James Macleod who named the outpost after the Calgary area on the Island of Mull in Scotland. Learn more at the History of Calgary. Over the years Calgary has evolved into one of the most economically strong metropolitan areas in Canada and lays claim to countless other titles from media groups and research institutions such as the 5th Best City to Live in the World, the Best City to Live in Canada 2013 and many others. 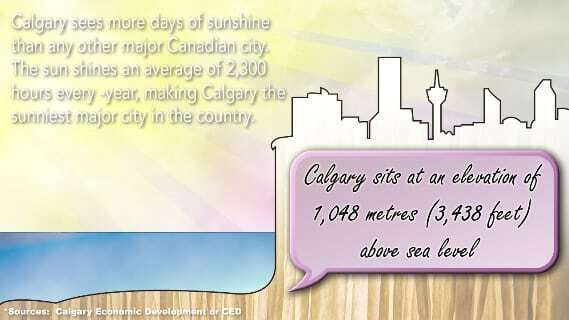 Calgary also has beautiful weather, with the most days of sunshine per year than any other major Canadian city. 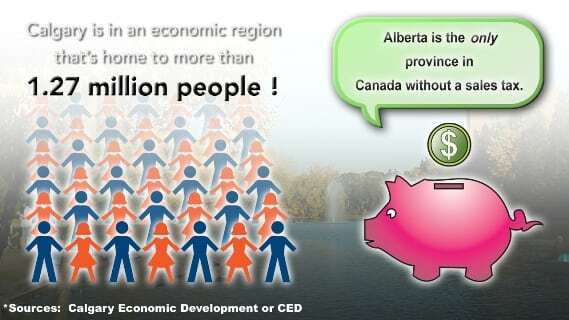 Learn more at Alberta has the Best Weather in Canada! Calgary is situated in a highly desirable location only an hour’s drive from some of the most beautiful Canada National Parks around such as Banff National Park, Kananaskis Country, Jasper National Park and many more. As a matter of fact, the city is a reasonable driving distance away from more than 5 world class ski resorts, lots of amazing lakes, the United States border and so much more. 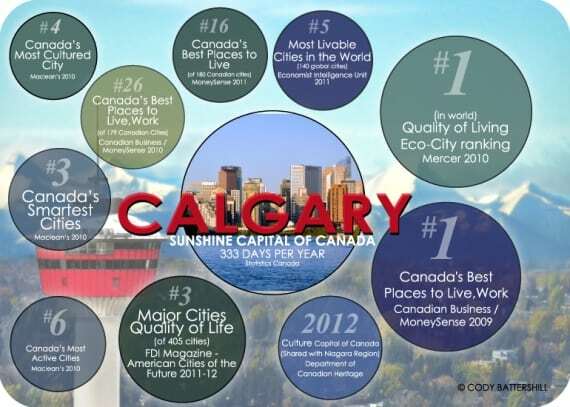 Learn more about this amazing city without having to read at our Calgary Facts and Infographics! Diverse: About 25 per cent of Calgarians are foreign-born. Calgary is Diverse. Accepting: There are close to 120 languages spoken in the city. Calgary is Multicultural. Green: Calgary has over 7,500 hectares (75 square kilometres) of parkland and public green spaces, as well as the longest paved urban pathway system on the continent. It runs for more than 700 kilometres and is easily accessible from virtually anywhere in the city. Calgary Public Transit now carries more than 95 million passengers a year. 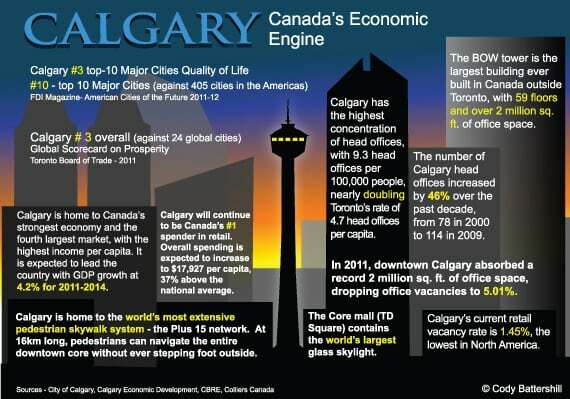 Has 18 km’s of pedestrian walkways & 63 bridges in Calgary’s +15 system making it the largest of its kind in the world. The first +15 bridge was built in 1970’s linking the Westin Hotel to “Calgary Place” across 4th Avenue. It soon became known as “Plus 15 ” because it is roughly 15 feet above the ground. Check out these Calgary Articles!! !